The summer before Enzo enters sixth grade, his dad takes a job with Kap, a company cooler than Nike, Timberland, and Marc Ecko. Even better, he gets to spend the summer traveling with his father and the super-awesome CEO/designer/head of the company. Working out all summer, meeting new people, and growing up makes him come back a different kid--more confident and self-assured. 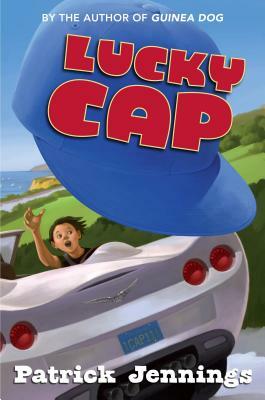 But when all the other kids, especially the girls, start paying attention and treating him differently, he credits it all to his cool prototype Lucky Cap. Flirted with, more popular, invited onto the sports teams--it's all thanks to his Lucky Cap. And when it disappears, Enzo stops at nothing to get it back so he won't lose his new-found status...only to sabotage himself. Patrick Jennings blasted onto the children's book scene with his critically acclaimed "Faith and the Electric Dogs," which received numerous starred reviews and is now in film development. "Guinea Dog" was called "a very funny book...would be particularly great for fifth-grade boys." by wired.com. Now that his children are middle-grade age, he has turned his focus to writing funny, easily accessible stories that will appeal to middle-schoolers. A former resident of Bisbee, Arizona, Jennings now lives in Washington State. Visit him online at www.patrickjennings.com."